All that is solid melts into air in this ambitious new exhibition, which sets itself the lofty task of giving artistic form to this most immaterial of substances. Spanning over four centuries of British art, the expansive collection of works now on display at the Royal West of England Academy in Bristol takes a freewheeling, multifarious approach to air and atmosphere, from flight, breath, clouds, wind, pollution, to hot-air balloons. ‘What is the sky without clouds?’ In the catalogue accompanying Air: Visualising the Invisible in British Art 1768-2017, Exhibitions Curator Gemma Brace ventures an answer: ‘without clouds there is no sense of space or time to the vastness above us.’ If the stated aim of this new exhibition, occupying a suitably airy series of high-ceilinged rooms at the RWA, is to ‘visualise the invisible’, capturing clouds seems like a good place to start. Image Credit: L. S. Lowry, A Manufacturing Town (1922), oil on panel, 43.2 x 53.3 cm. British Council Collection. Photo © Art Image Library LTD. © The Estate of L.S Lowry. It was John Constable who encapsulated the Romantic era’s predilection for gazing heavenward with his concept of ‘skying’, the act of looking up at the clouds in a state of artistic meditation. The roving, ethereal nature of the sky provided a source of endless inspiration for many artists of the time. 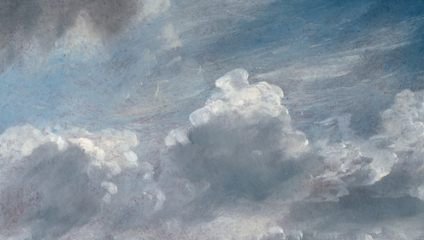 In 1821-2 Constable made a series of sky studies in oil, keeping notes of the time of day and weather conditions in a visual cloud diary, complete with jottings like: ‘morning under the sun – clouds silvery grey, on warm ground sultry’. He even had a favourite type of cloud: the frothy cumuli. J. M. W. Turner was another great painter of clouds, preferring swirling washes of watercolour over oil. In his unfinished work The Thames above Waterloo Bridge (1830-5), the space of the sky is dominated by the dark plumes of smoke emerging from two funnels of a steam boat, with smoky factories against the city shrouded in mist in the background. This was a time when visitors to London frequently commented on the low-hanging smog of soot and smoke over the city. Further paintings highlight this growing industrial nature of London, like the towers of Lowry’s A Manufacturing Town (1922). Of course, the act of inhaling marks the point of communion between air and body; the point at which air becomes breath. Various artworks address this here, notably in Annie Cattrell’s exquisite glass sculpture Capacity (2007), which used the pressure of exhaling breath to map the tiny bronchioles of a pair of lungs. This fragile, beautiful artwork shows the human organ in all its glittering frailty. Meanwhile Neville Gabie’s Collective Breath (2014) used a drum-like contraption to collect the breath of 1,111 people and use it to play a single note over the Atlantic Ocean for 49 minutes. Another distinctive element of our relationship with air is flight. In Christopher Nevinson’s Battlefields of Britain (1942) the Official War Artist painted the English fields from the pilot’s perspective above the clouds. Balloons take on a sinister symbolism in The Balloon Apron (1918) by Frank Dobson, where the bright blue of the sky is studded with barrage balloons designed to force enemy aircraft to fly higher, thus protecting towns and factories from bombing. More modern works by Bridget McCrum include fluid sculptures and drawings of curved birds in flight, wings outstretched. Image Credit: Joseph Wright of Derby, An Experiment on a Bird in the Air Pump ,1768, oil on canvas, The National Gallery, London. © The National Gallery. The opening of this exhibition coincided with the first ever National Clean Air Day on 15 June, and the awareness of air quality and our dependence upon it are referred to repeatedly in the exhibition. The first Clean Air Act was passed in 1956, after the great London smog of 1952 which lasted for five days solid. With works of such beauty and variety on display, we should wake up to our fragility in the face of this turbulent atmosphere and pay homage to this air that we live and breathe. Air: Visualising the Invisible in British Art 1768-2017 is on display at the Royal West of England Academy until 3 September.